This new partnership with Pure Minutes is part of Intermex’s ongoing commitment to build long-term relationships with their customers by providing value for their money. Our partnership with Intermex will help strengthen our relationship with the unbanked Latin American community in the US. Pure Minutes and Intermex Wires Transfers, LLC are proud to announce an alliance which joins affordable international calling solutions with a leading processor of money transfer services in the U.S. to Latin America corridor. This strategic collaboration connects Pure Minutes to Intermex company store customers throughout the U.S.
Intermex (link) is the second largest privately held money transfer provider for wires to Mexico and Guatemala and is licensed to operate in 45 states and in more than 1,200 cities with non-exclusive agents and company stores. More importantly, Intermex works diligently to ensure that all financial transactions are handled in a fast, affordable and secure manner. Intermex caters to the diversified needs of the Latin America corridor and leverages its position as one of the largest payer portfolios in the industry to serve its growing customer network. The company’s extensive network includes more than 30,000 foreign payer locations and is one of only three companies in the industry that has the ability to distribute payments in Mexico and Guatemala through its proprietary network. The venture allows Pure Minutes to deliver its signature low international rates directly the Intermex company store network available in the United States. Pure Minutes offers users the ability to make international calls from any phone regardless of the current provider which means users don’t have to change their current landline or mobile cell phone number. Subscribed callers simply dial a local access number and through modern “Automatic Caller Identification” software we can recognize a subscribed caller making the need for complicated PIN codes a thing of the past. PURE Minutes is a leading provider of prepaid international long-distance calling solutions. We provide an affordable communication solution that offers flexibility, portability and ease-of-use for both landline and mobile users. PURE Minutes offers competitive international calling worldwide with no hidden fees, no maintenance fees, no contract required, and minutes that never expire. 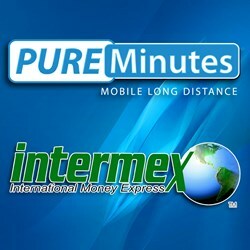 PURE Minutes service is sold on the web and through regional and national retailers including Intermex Wire Transfers, MoneyGram, La Nacional and payXchange and is available to customers worldwide in English and in Spanish and accepts payments through all major credit cards and Paypal.